Please contact owner David Email: DavidVarner15@gmail.com - Phone: 812-562-0851. Restored Boat includes Tons of Extras, plus Mastercraft Trailer with New Brakes, Wheel Bearings and Tires, with new sparerim. Reborn Wakeboard Tower, 2 Board Racks, 2 New Kenwood 10" Subs, 2-Kenwood 450w RMS Amps, 4 Infinity Speakers and New BT Stereo Receiver. LED Lights in Boat and on Trailer, Carpeting, Lots Of Storage, Two batteries, 351 Windsor Indmar Engine, Full Gauges, Swim Platform, Boat Cover, Coast Guard Safety Package, Anchor, and Mastercraft Graphics Kit. 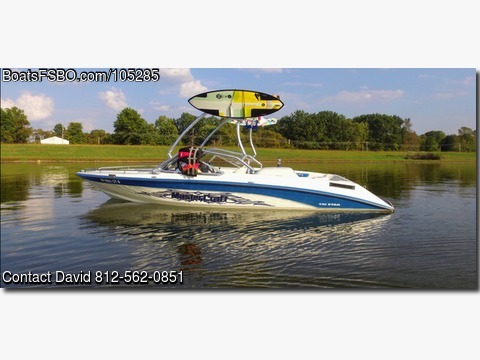 Great Running Boat, Always Professionally Maintained with Heated Storage Indoors. $4,206.87 worth of extras/restoration.